3rd floor. Small "attic" economy guest rooms. 1st floor. Hotel lobby, standard, and deluxe guest rooms. Courtyard level. 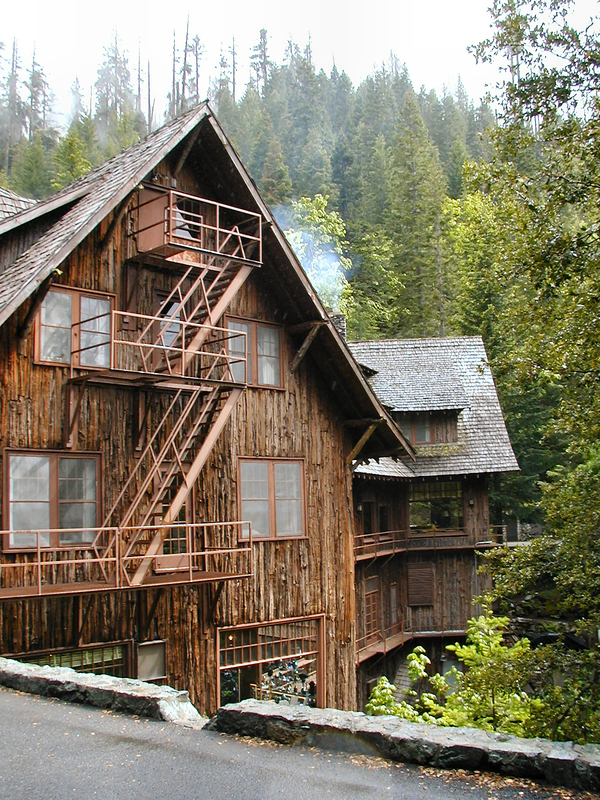 * Dining room, coffee shop, kitchen, and gift shop. Upper basement. 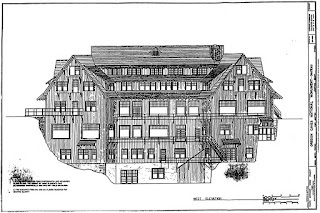 Laundry, storage, employee dining room (community room), and employee rooms. Lower basement. Equipment room, workshop. *The naming of the Chateau's floors varies depending on the source. The naming scheme I have used here is based on the room numbering, rooms numbered as 100's on 1st floor, 200's on 2nd floor, 300's on 3rd floor. 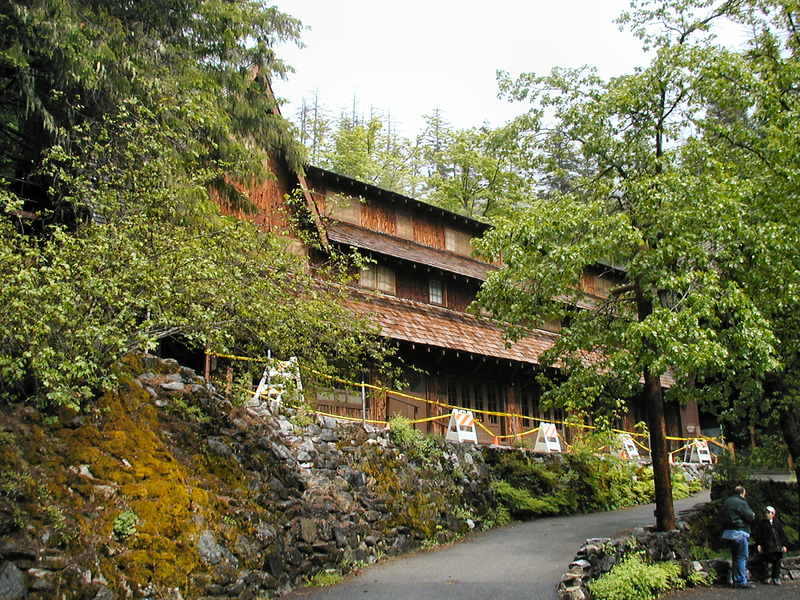 "Oregon Caves Chateau" or "The Chateau at Oregon Caves." So what's in a name? Not much difference between the two variations, but it has created some heated debate as to which is correct. 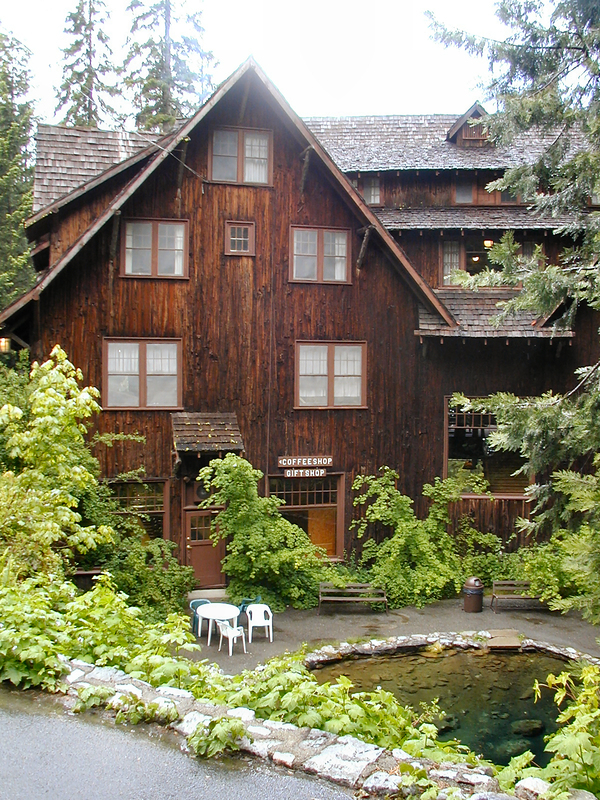 The National Park Service documents use the "Oregon Caves Chateau" name. 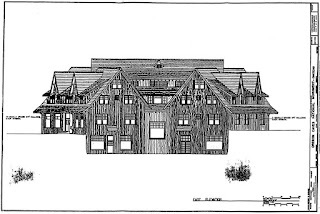 I have a copy of one of the original drawings of the Chateau made by Gust Lium, the builder, he wrote on it Oregon Caves "Chateau". 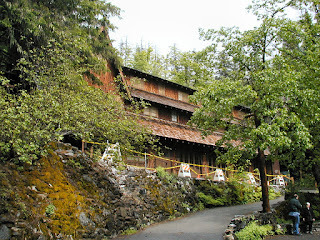 But if you ask around you will find plenty of support for The Chateau at Oregon Caves name too! My approach will be to offend everyone by using both names throughout this tour. Approaching the Oregon Caves Chateau from the day use parking lot you first notice the Chateau building through the trees on the right. A few feet further up the road the side and rear of the Chateau comes fully into view. At this point it becomes obvious that much of the Chateau is below you in the creek bed. A quick look at the back of the Chateau reveals it's most unique character. It straddles the entire width of the creek bed, like a dam. After walking over to the stone wall at the edge of the driveway, you can look down at the back side of the Chateau. 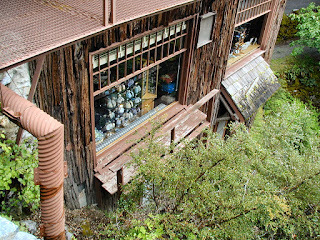 The gift shop window below you is apparent from the souvenirs displayed in the window. Another look at the same rear wall (you can see the gift shop windows from the above picture at the bottom of this one.) Note the metal fire escape. 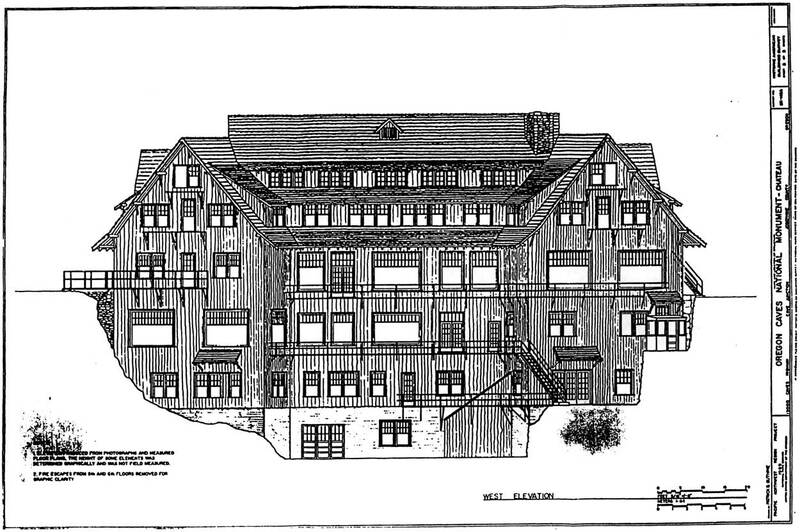 Originally the building had wood balconies, but they fell off in a heavy snow, and were replaced with metal. 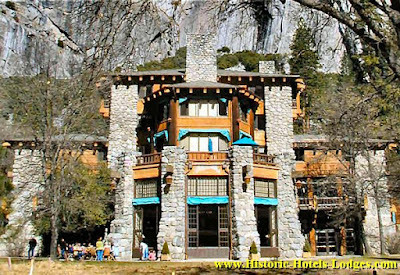 (The Park Service plans to restore the original balconies during a major restoration scheduled for 2018.) 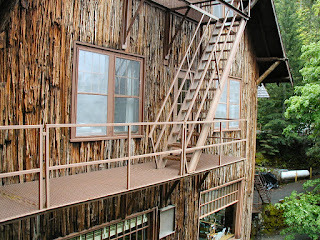 The windows above the fire escape are guest rooms on the 1st floor. 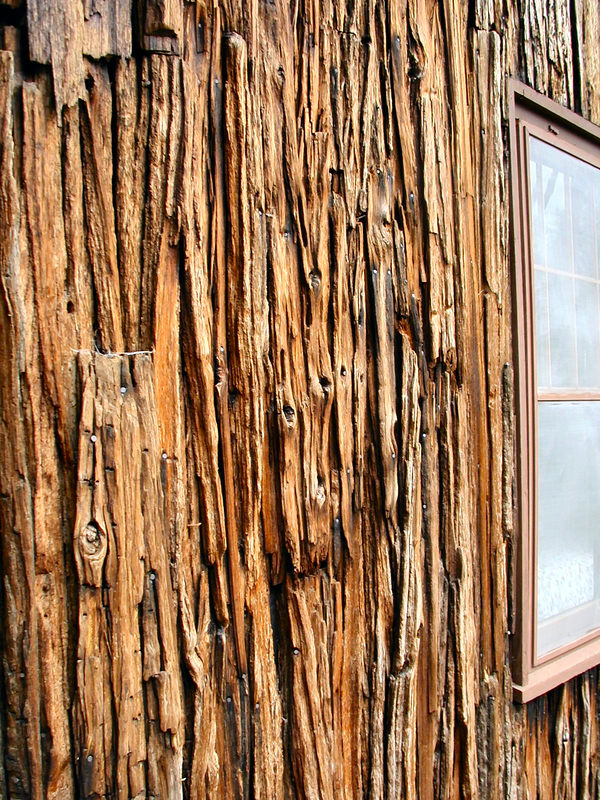 As the road passes by the side of the Oregon Caves Chateau, take a moment to notice that strips of Cedar tree bark is utilized as siding. 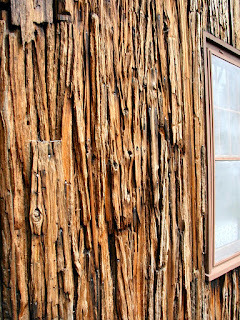 The bark gives the building a very rustic appearance. 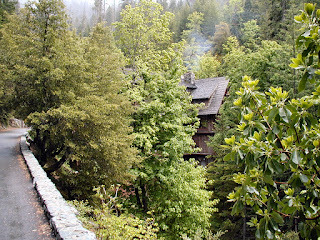 Almost all the materials used to build the Chateau came from the surrounding forests. As you continue up the road you pass by the Chateau and the road makes a horseshoe curve across the creek bed to the right. The road wraps around the Chateau. This photo is looking back at the side of the Chateau you just walked past. The windows in this photo are guest rooms on the 1st and 2nd floors of the Chateau. If you look closely you can see 3rd floor attic room windows also. Continuing on the service road you notice this building on your left which is the Oregon Caves Chalet. Like the Chateau, it also straddles the creek bed. 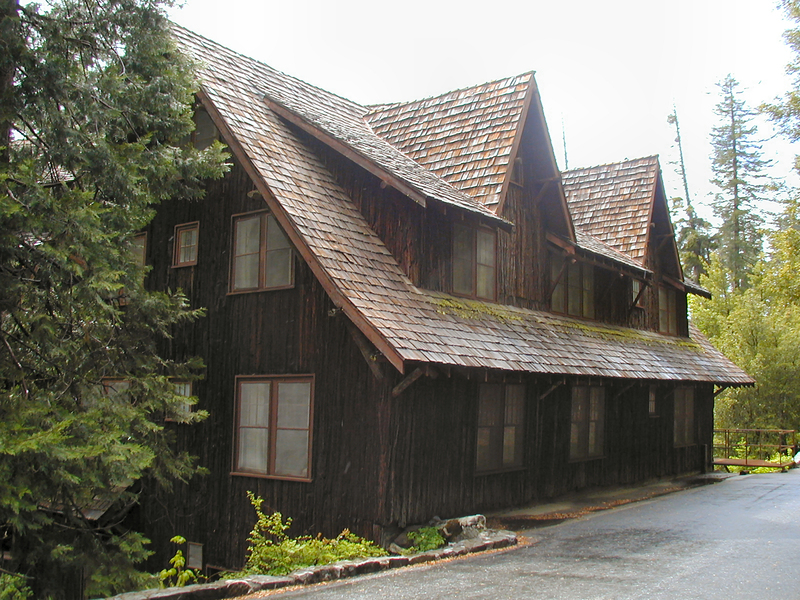 The Chalet is the Park Service Visitor Center building where the cave tours start. 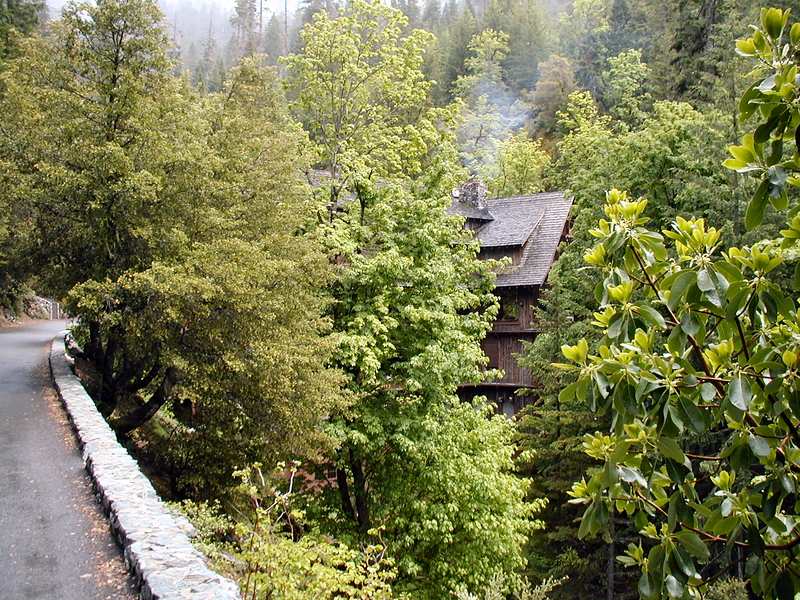 The road passes between the Chalet and the Chateau. The road continues to curve completely around the front of the Chateau, and soon the trout pond and courtyard come into view below you on the right. The coffee shop door is visible on the courtyard level. 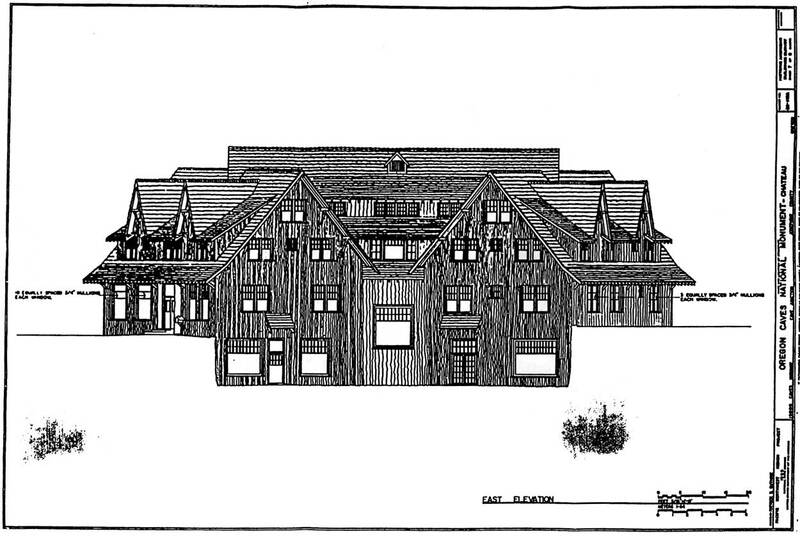 Above the coffee shop are windows for the guest rooms on the 1st, 2nd and 3rd floors.